Even as late as 1839, Boddam had no harbour and the fishing boats had to be hauled up on to the rocks. There were 23 herring boats at that time each earning around £100 per annum. Herring fishing lasted from July to September and summer haddock fishing from March to July. Some 22 small yawls were used for this type of fishing. The price obtained for haddock was £3 to £4 per 100 and each boat might reckon on catching up to 3000 fish during the season. A harbour was constructed to the north of the lighthouse in 1831. Lord Aberdeen added another harbour in 1842 and this led to a great increase of boats employed both in the white and herring fishing. By 1840, there were 23 herring boats working from the harbour and in 1881 there were 151 drifters using the already very busy harbour. In its heyday, Boddam could boast a total of 13 curers resident in the village. In 1845, Boddam became a registered port by Act of Parliament. 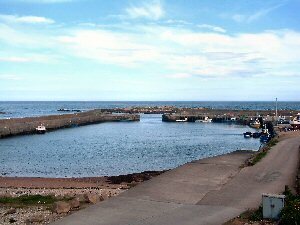 By the end of the nineteenth century, despite the widening of the harbour in 1878, Boddam declined as a fishing port while Peterhead reaped the benefits of a larger harbour.